A bust of Confederate Lt. Gen. Alexander P. "Old A.P." Stewart is seen outside of the Hamilton County Courthouse on Wednesday, Aug. 16, in Chattanooga, Tenn.
Photo by C.B. Schmelter /Times Free Press. 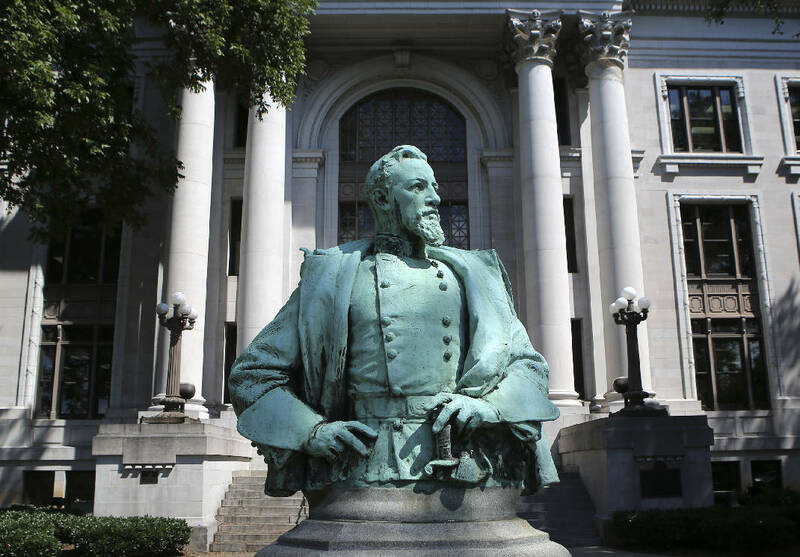 The Chattanooga chapter of the NAACP plans to hold a candlelight vigil on Sept. 9 in front of the Hamilton County Courthouse to rally community support for the removal of the statue of Confederate Gen. Alexander P. Stewart that sits on its front lawn. The vigil will be held in front of the courthouse at 7 p.m.
"We will have ministers and clergy praying over our city," said NAACP Chattanooga President Elenora Woods, adding that the message of speakers at the vigil will focus not only on the removal of the bust, but "all injustices and discrimination" against people of color and those who are poor. Woods also announced the launch of a petition to move the statue. She said NAACP members gathered about 100 signatures on Saturday and added an online form of the petition to the NAACP website Monday. "One of the things that our [Tennessee NAACP] president wanted us to do was to make sure we had the community's support," Woods said. Once they've gathered enough signatures, Woods said members will go before the County Commission to ask to have the statue moved. "I think places like the courthouses and capitols is a place where all Americans come to have their dreams and ideas realized, and that's not the appropriate place to have [the statues]," Woods said, adding that it's not the NAACP's goal to have the statue destroyed — only moved. "We are not attempting to remove history here; we are attempting to put history in it's proper perspective," Woods said. However, several county commissioners earlier this month expressed mixed feelings regarding the bust's removal. Commissioner Tim Boyd told the Times Free Press that Stewart wasn't a slave owner and instead fought for the Confederacy in defense of states' rights. "This is a much bigger issue than just a statue sitting on the lawn," he said. "This is stupidity on the public's part and the media's part by focusing on moving monuments." Commissioner Greg Beck said his feelings on its removal were "neither here nor there," but he argued that if it remained, it could serve as a reminder to residents about the folly of conflict like the Civil War. "If it stays there it's a monument to the inability to compromise and also it intends to speak a message that 628,000 people lost their lives over an issue they could not find a resolution to," he said. The announcement of the vigil and the launching of the petition comes just over a month after the NAACP said it would begin efforts to remove a Confederate statue from the front of the Hamilton County Courthouse. The announcement was followed by a significant amount of pushback from community members voicing their opinions to the Times Free Press via phone calls, emails and comments on social media. In a Times Free Press poll asking readers if they think Stewart's statue should stay at the courthouse, an overwhelming 443 votes out of 564 were in favor of it staying. Despite the opposition felt on social media, Woods said she has not personally experienced any pushback in any form, but she said the NAACP will be ready for counterprotestors and have police security during the vigil early next month. "This is not just black folks who want the Confederate statue taken down, this is about the country wanting to come together and move past this issue," Woods said. Contact staff writer Rosana Hughes at rhughes@timesfreepress.com or 423-757-6327. Follow her on Twitter @HughesRosana.